The NBA Playoffs tip-off Saturday, and AccuScore played out every series 10,000 times to simulate out the entire NBA postseason with a few surprises along the way, but the Golden State Warriors top the Milwaukee Buck in the NBA Finals for Kevin Durant's third straight title and the Warriors' fourth championship over a five-year span. Here's a look at the entire playoffs as AccuScore sees it. Before we get to the NBA Finals, let's start with the opening round. First time members get a free 7-day trial of AccuScore’s full site when you register for a monthly membership. 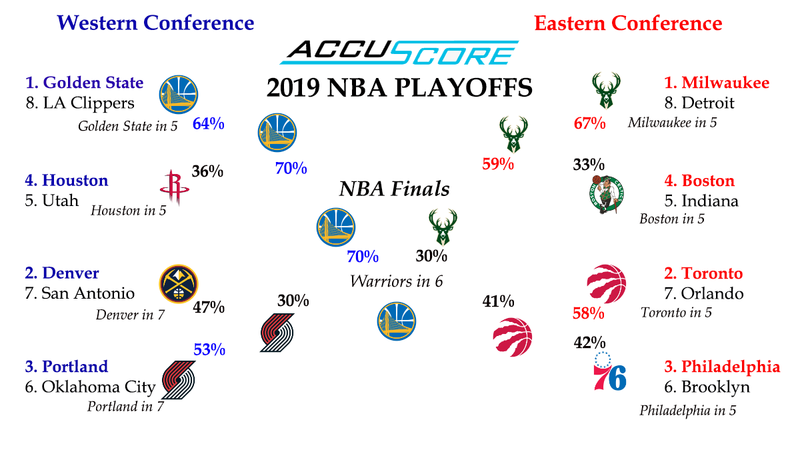 The Warriors sweeping the Clippers is obviously on the table, since the Warriors beat the Clippers in 92% of AccuSore's simulations, the most lopsided of any series in the 2019 Western Conference playoffs. Golden State has an 18.5% chance of clean sweeping the Clippers, which may seem low until you consider that that's more than double the Clippers' chances of winning the series. The Warriors' highest probability for a closeout game, however, is Game 5 with 38.6% of simulations saying the Warriors pull off the gentleman's sweep. The Nuggets and Spurs series is an interesting one, since San Antonio is long on postseason experience, while Denver is here for the first time in forever. The Spurs may not pull off the upset, but they are projected to test Denver, with the Nuggets' most likely closeout game projected as Game 7 at with 21.7%. In all, the Nuggets hold a 61% to 39% edge on the Spurs, according to the computer. The Portland and Oklahoma City series is probably the closes matchup of the first round, with OKC possessing arguably the two best players in the series. Home court in the playoffs, though, is no joke, and these two teams especially understand the importance of playing at home. The Blazers are projected to win 57% of the time, with the most likely outcome a Game 7 win for Portland on the Blazers' home court. Utah, sadly, doesn't figure to have much of a chance against Houston. James Harden, Chris Paul and company are simply too strong for Utah. The Rockets won 74% of simulations, with the Rockets winning in 5 games 24.1% of the time. The only series more lopsided than the Warriors against the Clippers is the Bucks and the Pistons. The Buck won 93% of simulations. Pray for Detroit. Toronto torched Orlando at a 90% to 10% clip, so the top of the East is expected to cruise into the second round, where the playoffs really get going. Philly and Brooklyn, surprisingly, is a mismatch according to the computer. Brooklyn has a great story, but the computer gives the Nets only a 16% chance of pulling off the upset. As long as the Sixers are healthy, they're expected to cruise against the Nets. The Nets ended the series in 5 games in 29.5% of simulations, which is the most likely end to what has been a fantastic season for Brooklyn. Boston may not be where most people figured the Celtics would be at this stage, but the Indiana Pacers don't project to be the team to end the Celtic's season. Boston won 72% of the series in simulations, with the series ending in 5 games (24.3%) and 7 games (22.3%) the most likely conclusions.